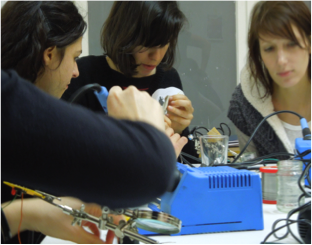 In a three-day workshop we will hack hardware, make noise and produce stencils with open-source software. We will ask a lot of “dumb” questions and also develop technology together to accomplish an artistic project. No expert is required for participants. We want to share our knowledge and equipment and use the opensource tools of technology to express ouservelves in a new way. 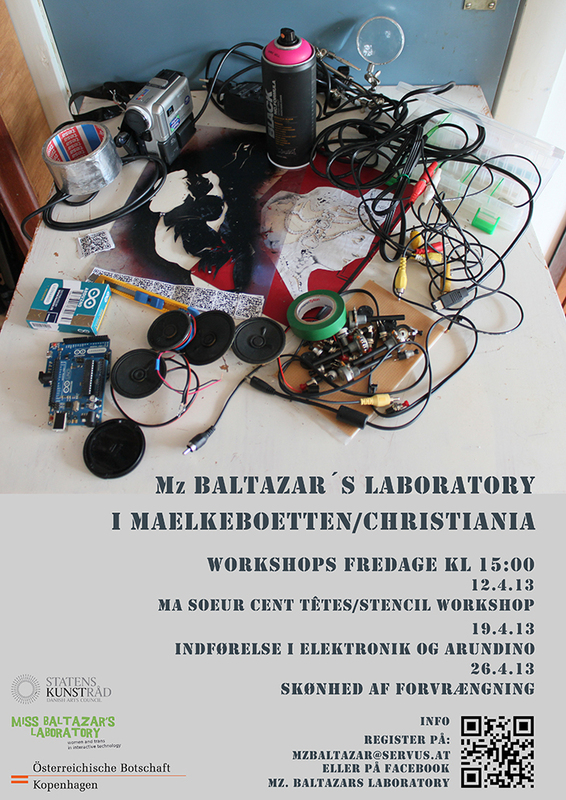 Mz Baltazar’s Laboratory offers to women and trans the opportunity to acquire skills in electronics and programing to realize interactive projects. 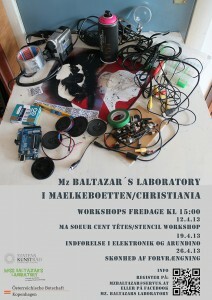 The workshops will be held on Fridays at 15h in Maelkeboetten/ Christiania. Ma soeur cent têtes is a gender-feminist street-art project. 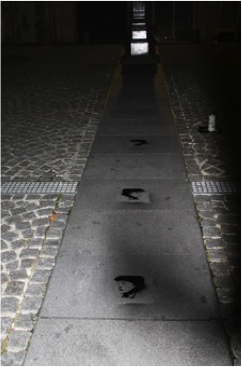 Maria Hera collected biographies of women who did interesting things in the past/future, made stencils out of their portraits and sprayed it in public space. Every stencil is basically provided with a bar- or QR-code witch leads to the wiki- or website of the shown woman. The workshop is structured in the following way: depending to possibilities a viewing of the stencils on location or online is intended. Hereby the intention and concept are presented. In the second part the participants can learn the technic, according to individual interests, by creating self-chosen females or by cutting all ready existing stencils and spray them. The workshop empowers the participants to realize individual ideas or participate as a multiplicator in the process of publishing the women heroes. This workshop aims to introduce the basics of electronics, focusing on what is essential for exploiting the open source Arduino platform and therefore to build things using different kinds of in and out-puts. We propose a relaxed approach and we aim to provide a pleasant environment for exploring, playing with the tools and above all having fun! 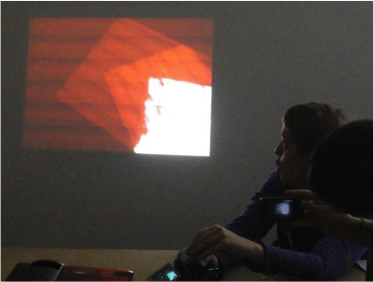 This workshop provides features to create visuals without the use of a laptop. In a playful way the powerful technical “magic box” is demystified and hacked. Electric disturbance signals generated by Audio Signals are used to create abstract video landscapes. To open up cables and learn how to modify the signals is a first insight into the operating mode of signal transmission and basic electronics. “Beauty of distorsion” is a glitch art project on the intersection of Video Art, Sound Art and Literature. With thanks to our Founding Partners: Statens Kunstrad Danish Arts Council & Osterreichische Botschaft in Copenhagen who have made this workshop series possible.